Before I list the songs that comprise my current top five (for my top 40s), may I share with you some of the 'dare to dream' lessons learned from this six-part series 'Tell your soundtrack story'? As I re-listened to music I loved as a girl, I remembered (I really had forgotten) that I once LOVED making music, playing the piano in particular. Which is why my recently volunteering/being asked to play the piano every Sunday for the children at our church is such a gift; I'm rediscovering the making of music, and taking back something that I loved. I'm even toying with trying to compose a children's song. Any lyricists or poets among you? As you listen to music from the time in your life when you still knew you were Rachel (see Thank Heaven for Little Rachels below), what do you remember about who and how you wanted to be? How can this remembering help you to be the hero of your story? 2) Are any of the songs/musicans we loved as teenagers the keepers of our dreams? In his book 'This is Your Brain on Music', Daniel Levitin writes "Safety plays a role for a lot of us in choosing music...To an extent, we surrender to music when we listen to it -- we allow ourselves to trust the composers and musicians with a part of our hearts and spirits." (see Soundtrack Story: Career, Motherhood and 9/11 below) Remember how each of my soundtracks had a song that I labeled as my 'imagine and explore' songs, from 'Everybody wants to be a Cat', 'Play that Funky Music White Boy' to 'Smooth'? As you re-listen to music you loved as a teenager, is it accurate to say that these songs felt safe to you? What did you aspire to be or do that you couldn't share with others, but shared with the musicians you listened to? Is it time to take this piece of our selves back? It is interesting to me that I loved Helen Reddy's 'I am Woman' thirty years ago, but it is striking that my 'girl power' songs have evolved from the myth of Psyche's head-butting to fleece-gathering 'girl power' (see Second Thoughts on Psyche's 2nd Task below) whether India.Arie or Zap Mama's songs. What will your soundtrack say about the finding of your voice? Virtual Insanity -- In the spring of 2005, just weeks prior to my leaving Merrill Lynch, I was in Holland in the back of yet another cab. Jamiroquai's 'Virtual Insanity' came on the radio. I was so taken with the music, I asked the driver to turn the volume up really loud. This song, more than any other, reminds me of the thrill of imagining and exploring and then daring. Sweetest Someone that I Know -- It wasn't until my husband and I had been married for over 20 years that I heard a song that pinpointed how I feel about him. It is fitting that this song came from the mind and heart and voice of Stevie Wonder. It also reminds me that when we as women undertake the hero's journey, the journey only has meaning if it helps us be happy at home. Miss Q'In - Love the music. Love the lyrics more. Zap Mama distills into one song my hope for me and for all women -- that we may travel far and wide, seeking to be a princess, but eventually we will realize that what we want is to be 'me'. Such a Rachel, learning-to-be-the-hero-of-our-story, song. For Good -- I've written extensively on this song (see Why I Like Wicked below), but at its most basic this is my systergy song. It always reminds me how happy and grateful I am to have so many women with whom I can share the dreaming and daring. Beautiful Flower -- India.Arie is herself a huge admirer of Stevie Wonder. Yet another Rachel, myth of Psyche song. For more details, see the 'A Song to dream by' below. P.S. One of my runner-up songs is Tamyra Gray's Ha Ha. This song gives utterance to the anger that I, and perhaps you, sometimes feel when what we want to give the world isn't received. (Note too that I was only willing to give it runner-up status -- some interesting psychology there no doubt). I've got a lot of thoughts about why anger is our friend. Another day. 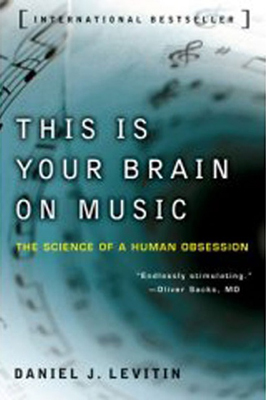 In his book This is Your Brain on Music, Daniel Levitin, a rocker-turned neuroscientist, explores the connection between music and our brain, providing some interesting insights on why we love the music we do. In particular, Levitin helped me understand why Stevie Wonder, who made his way on to my soundtrack as a pre-teen, was still on my soundtrack during my 30s, the decade of launching a career and learning to mother. He writes, "teenage years are emotionally charged years of self-discovery. Because of the emotional component of these years, our amygdala (the seat of emotion in our brain) and neurotransmitters (transmitters of information from the brain to other parts of the body) act in concert to 'tag' these musical memories as something important." What kinds of music and which artists did you love as a teenager? Now in your 20s, 30's, 40s, 50's, or 60s, do you listen to similar music? Isn't She Lovely -- Stevie Wonder composed 'Isn't She Lovely' when his daughter Aisha was born. I loved listening to this song as a teenager, cradling my newborns to it as an adult. It is a song that gave utterance for me -- and no doubt millions -- the importance of connectedness and caring. Smooth -- Definitely the 'imagine and explore' song in the mix. Not surprisingly this yearning plays out for me via Latin music. Fragile -- Having read Levitin's work, it's fascinating to me that the Police who were so popular during my relatively carefree college days, could capture the sadness, the grief at innocence lost on 9/11. Gratefully, I wasn't in my World Financial Center office to witness the horror firsthand, but I needed (as we all did) to eventually grieve. It was in a taxi, on my way into Manhattan, listening to Sting's Fragile, some weeks later, when I finally cried. Diggin' your scene -- Smashmouth's ode to the fictional Sydney Bristow on Alias. As Psyche would have acknowledged, Sydney was about connecting and caring AND daring and dreaming. As a 30-something trying to marry these two, Sydney Bristow was my archetypal gal. Smashmouth says it all. For those of you who want to explore musical intelligence (as defined by Howard Gardner), you will no doubt find Levitin's book interesting. Levitin also observes that if you want to be a great musician, or great at anything for that matter, practice -- not talent -- makes for virtuosos. If you'd like to test Levitin's premise that we hardwire our musical preference as teenagers, check out www.pandora.com, a music genome project, which allows you to specify a song you like, and via the matching of that song's DNA to the DNA of other songs, make recommendations. For example, knowing of my fondness for Stevie Wonder, I wasn't surprised that I instantly liked the Brand New Heavies. In analyzing my teenage 'tell your story' soundtrack, I observed a thing or two about myself. Not so much the need for story edits, but definitely some insights, clues as to what I might want to think about as I write my story into the future. As you scan this iMix, you'll see that, as a teenager, daring to dream for me was largely about becoming a cheerleader and finding true love. Piano and grades had become inconsequential, and angst was now on the scene: so much of living gets compressed into those four years. Which songs best tell the story of your teenage years? What do your song choices say about your emerging and shifting priorities as you moved out of childhood? Nature Boy -- Nat King Cole's music bound me to my grandparents (first heard his music at my grandparents' home) and parents (my mom heard him live in San Francisco before he died), even as I began to individuate. I think this song put to music some of the sadness of those years -- thrilled to be growing up. And not. Still the One -- In 8th grade, I went to see the Castillero Jr. High songgirls perform. After watching these pretty, and seemingly popular, girls perform to this song, I knew I wanted to be just like them. Always and Forever -- Being in love, and having my heart broken, for the first time. Ironic that I chose a tune which referred to 'always' and 'forever'. Can't Hide Love -- Though the song makes me so, so happy today, as a 16 year-old, 'Can't Hide Love' always made me think of two boys (they don't know it of course) to whom I had given my heart. P.S. Because I need to figure out a technical thing or two, look for the the second half of my soundtrack story in January. Definitely, definitely consider creating a musical mix for your children, grandchildren. As I pull together these songs, limiting myself to only five songs (constraints can be a good thing), I am not only sharing the highlights of my soundtrack story, I am finding that I'm re-writing certain portions -- edits can be a very good thing. I Woke Up in Love This Morning -- My crush on David Cassidy was so HUGE. I still have a picture of myself standing by a poster of him in my bedroom. And, as I've shared previously, it was remarkable to me that Shirley Jones could be an ingenue AND a mother. I am Woman -- We would listen to Helen Reddy on an 8-track player as my mom would taxi me to ice skating. I LOVED taking ice skating lessons; gliding over the ice I felt such my sense of self surge. In hindsight, I'm laughing that I liked this song so much; my desire to affirm 'us girls' seems to have started at the tender age of 10-11. Come, Come Ye Saints -- Singing this hymn always moved me, an homage to both my spiritual heritage and family roots, especially of my pioneer ancestors that settled southern Arizona. Don't you Worry 'Bout a Thing -- My lifetime love affair with all things Spanish/Latin America began at an early age, with my birth actually: my children even think that we are part Spanish. But not sure why I have such a love for the music of Stevie Wonder. Perhaps because his lyrics give utterance to my deepest feelings/longings in a way that few musicians can and do. Ease on Down the Road -- Another happy, carefree song, that encourages me to imagine and explore, to face my fear. What if my great grandmother had bequeathed to me an iPod (suspend your disbelief for a moment) with songs that had inspired her? What if she had annotated her musical mix with a sentence or two saying why these songs had been meaningful to her? In short, what if she had told her story with a soundtrack to her life? On the odds that I will someday be a great grandmother, and because I do have an iPod, I hereby bequeath to my children Part I of my soundtrack story (thanks to iMix), the music which inspired me as a child, as well as my best-loved Christmas songs. What songs were most meaningful to you as a child? Why? Which Christmas songs do you cherish? What if you were to create your own iMix and e-mail it to your children and grandchildren as a last minute Christmas gift? Do-re-mi -- The Sound of Music, which I saw for the first time at San Jose's domed Century theaters next to the Winchester Mystery House, was the catalyst for my playing the piano. I still remember plunking out 'do -- a deer, a female deer' when I was three. Given that I have only two memories from when I was three, need I say more? Melody -- I played this by Robert Schumann at my first piano recital, around the age of 7. I loved to play the piano; playing well nurtured my growing sense of self. 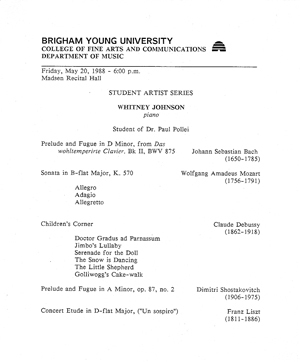 Six Grande Etudes after Paganinni -- My family listened to Andre Watts almost every Sunday; as an 8-9 year old, hearing Watts play (and also seeing him in concert) encouraged my dream of becoming a concert pianist. Abide with Me, 'Tis Eventide -- As I sat in our chapel on Cherry Street late one Sunday afternoon, the singing of this hymn, stirred deep spiritual feelings within me. It is the first memory of this kind. Everybody Wants To Be a Cat -- The Aristocats was so real to my 8 year-old self. This particular song was rowdy, and happy, and tapped into a creative impulse which manifested itself in my sister and I making up dances. Remember the kind: carefree, uninhibited dances that only young children are capable of doing. It's the Most Wonderful Time of the Year -- Whenever I heard Andy Williams belting out this song, the Christmas season had officially begun. Tchaikovsky's Nutcracker -- My mother took my sister and I to San Francisco every year to see the Nutcracker when I was growing up. Even today, I thrill at the music which accompanies the Christmas tree growing and growing and growing. It was pure magic! Have yourself a Merry Little Christmas -- I could have chosen the entire Carpenters' Christmas Portrait, but this song best recalls the occasional longing I felt for home as a 21 year-old on a mission in Uruguay. Vince Guaraldi's 'Oh Tannenbaum' -- If there is an album that most recalls our happy decade in Manhattan, it's this one. And because I still daydream about becoming Diana Krall's younger sister (musically speaking), 'Oh Tannenbaum' is one of my favorites. I Heard the Bells on Christmas Day -- Definitely my favorite Christmas song. When I sing "God is not dead, nor doth he sleep", my heart swells with gratitude for the birth and life and death of Jesus Christ.